Finding Joan in the pasture. Those of you who have spent time with me in the last seven years have probably heard me mention my very special sheep, Joan. I know each of my thirty sheep on sight, but not all have names or interact with me on a daily basis. But greeting Joan with a pat or a hug each day has been my happy practice for years now. Many flocks have what is often called a leader ewe that acts as a bit of an ambassador between shepherd and flock. (In fact, Icelandic leader sheep are kept as a separate genetic line within the breed.) My dear Joan is a born leader; she’s quick-witted, observant, and quite bossy. She came into the world that way and I’ve never met another sheep like her. She also loves cats. Joan and one of her many cat friends. Joan has a shrill alert call that she only makes when something is amiss. If a sheep jumps a fence or is ill, she starts pacing and calling to us. During lambing time, I know if there is a ewe in labor before I get to the barn because Joan has rung the alarm. I’m lucky to have her help! So, when I found out that a picture I took of Joan on pasture would be on the cover of the winter Spin-Off, I was pretty excited. 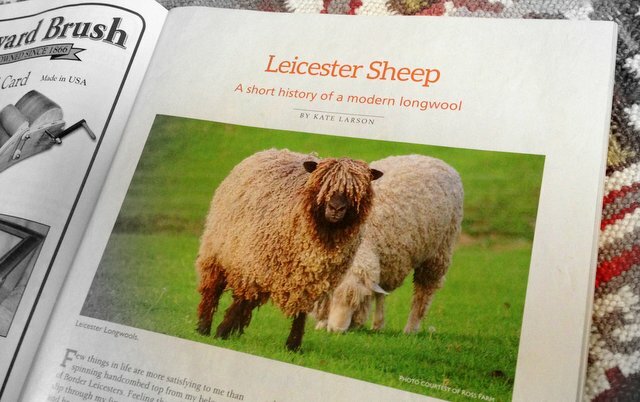 Leicester Sheep article from Spin-Off winter 2015 by Kate Larson. The photo featured on the first page of the article is from Ross Farm. I wrote an article for this issue about one of my favorite topics: “Leicester Sheep: A short history of a modern longwool.” These wonderful breeds (Leicester Longwool, Border Leicester, and Bluefaced Leicester) have changed and evolved over time as they’ve adapted to new environments and purposes. So, I wanted to pair each breed description with a profile of a specific flock. Our choices as shepherds can dramatically impact how a flock looks, their health and habits in just a few generations. The article includes profiles of three amazing flocks, which I’ll include below. I also asked Bluefaced Leicester breeder Robina Koenig about her flock and what she looks for in these special sheep. Bluefaced Leicesters in full fleece at Tumble Creek Farm in Bend, Oregon. Photo courtesy of Robina Koenig. I’ll be using Robina’s fibers in my 2015 Leicester workshops. 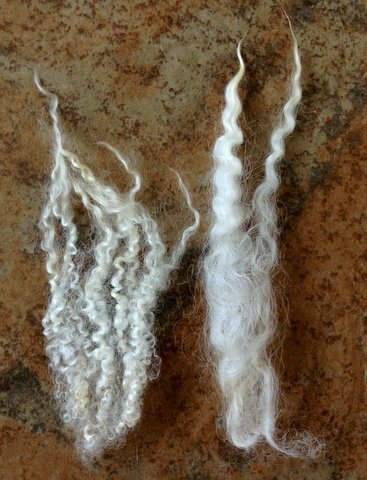 You can find her fleeces, rovings, and dyed fibers on the Tumble Creek website. The Ross Farm – Leicester Longwool breeders in Pennsylvania, USA. Marsh Creek Crossing – Border Leicester breeders in Minnesota, USA. 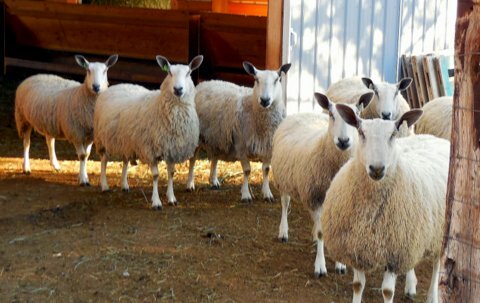 Little Smokey Bluefaced Leicesters – BFL and BFL crosses in Saskatchuan, Canada. Kate, good work on the photo of Joan and your article of Spin-Off. I had a ewe that was my alarm ewe. She was Shetland x Finn and if there was something amiss she would run screaming to me, bleat a couple of times then run towards the issue turning around about 20 feet away from me to see if I was following. If I wasn’t following, she would come back to me and repeat the process I learned very quickly to listen to what she was alarmed about. She was a good one! Now I have Grace. Grace is also Shetland x Finn. She isn’t as good as Daisy was, but she is the loud mouth of the flock! I hope to see you at Jay County. Hi Kate–aren’t bossy sheep great? See you in March! Best wishes to you and Grace. Loved getting to read all of your blog today! I love the picture of Joan and the kitty!